These films refuse to get old. Next month will see the addition of ‘The Flash’ Season 2, ‘Unforgiven’, ‘Three Kings’, Christopher Guest’s ‘Mascots’, and more. 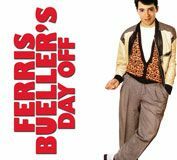 Listen to Mr. and Mrs. Bueller, you all, and attend Ferris Fest.